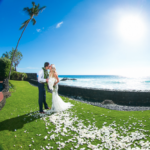 This hawaii wedding took place at a public beach called A-Bay just North of Kona, Hawaii. It was just the couple, me and the minister. The couple had rented a Mustang for their wedding and honeymoon and were excited to get a photo of it. Thanks for letting me be your Kona wedding photographer.